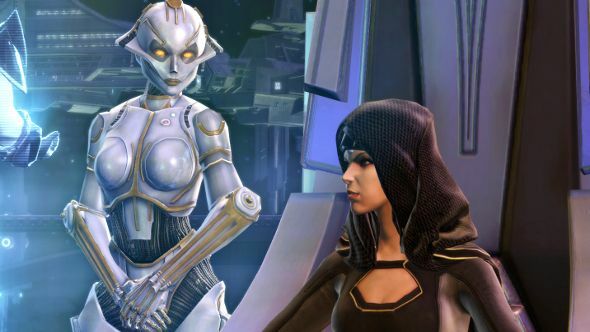 Star Wars: The Old Republic’s 2015 expansion, Knights of the Fallen Empire, was more than a surprise; it’s the closest thing to a Knights of the Old Republic sequel, but within the framework of an MMO. BioWare aren’t done telling that story, however, and a new expansion, Knights of the Eternal Throne, is poised to continue the galaxy-changing adventures of the Outlander and their motley crew of troublemakers and heroes. Don’t like to RPG alone? These are the best MMOs in existence. 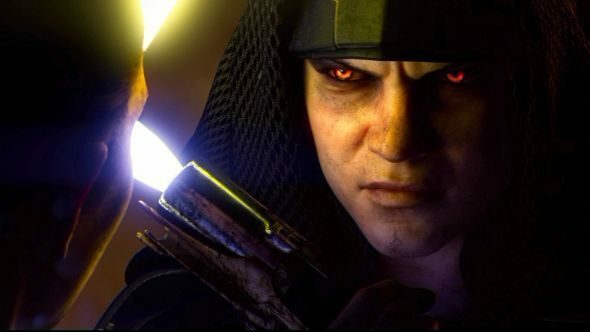 Over the last year, BioWare have been putting a greater focus on the light and dark side choices that players get to make by the truckload. These moral decisions have always been key to the MMO, but with Knights of the Fallen Empire they became even more integrated into the story. Indeed, it was those personal choices that ended up defining the expansion, instead of classes and allegiance to the Empire or the Republic. 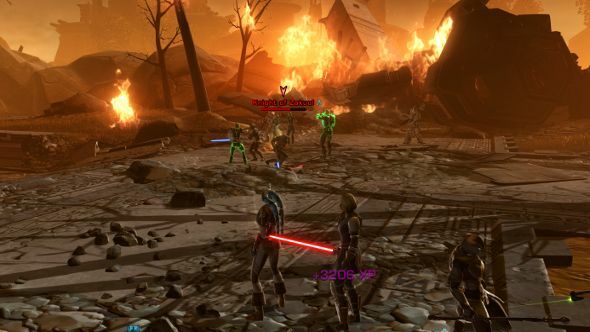 Then the Dark vs. Light event kicked off, encouraging players to make new characters and take them through the entire game, exclusively making either light or dark choices. 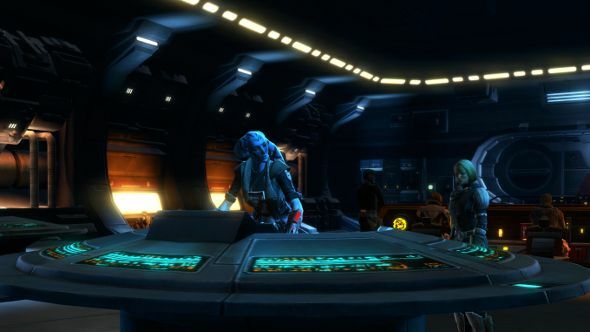 For each challenge tier, there were plenty of rewards, and whichever side of the force proves to be more popular determines what companion players are rewarded with at the end of the event. With Knights of the Eternal Throne, BioWare are doubling down on this focus, both in terms of the narrative and mechanically. In the story, your adherence to one or the other side of the force will create sweeping changes. Your one-time foe Arcann, son of the old Emperor, will play an entirely different role depending on your choices. If you’re of the goody two-shoes persuasion, he might be an ally in the player’s war against the new Empress, Vaylin – his evil sister – and he’ll even get rid of that ominous mask and stop cosplaying as a cyborg. More inclined to be a villain? You’ll find yourself crossing lightsabers with him, again, as he goes back to being one of your most deadly enemies. 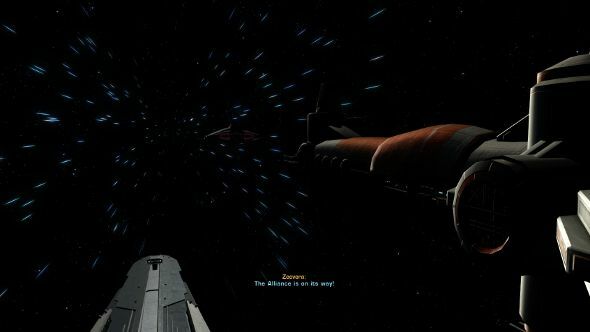 People live and die, fight with or against you, depending on your character’s moral compass, and while the galaxy-spanning stakes remain from the original class stories, they’re grounded in a tale of family and loyalty that’s more evocative of the slightly soapy moments of Lucas’ two trilogies. In this case, it’s very much for the better, adding more weight and emotional consequences to the proceedings. So the call you make about Arcannn happens really early on, and it has immediate consequences. He’s injured and broken and being looked after by his mother, Senya. You can forgive him and help him become a better man, or you can go down the path of revenge. The impact then echoes across the other chapters, informing new obstacles and how you deal with the biggest threat: Empress Vaylin herself. That’s the force’s effect on the story, but there’s also a new Dark vs. Light system that’s somewhat inspired by the recent event. In every server, there’s a war bubbling away between the two sides, and every few hours one of them wins. If the Sith win, then powerful Sith Lords will crop up all across the galaxy, and groups and guilds of light-side heroes will need to scout worlds and eradicate them. If the light-side of the force gets a leg up, then the Sith and their pals will need to wipe out the Jedi threat. “Your choice, whether you fight for the light or dark side, is more important than ever before,” says Ben Irving, lead producer. And it reignites the sense of competition and playful animosity between the two factions in the playerbase, the central conflict that’s defined Star Wars for decades. Along with this come new gameplay mechanics that BioWare hope will evoke the fantasy of the films. “Between these epic story moments you have to play this game,” continues Irving. “And you have to enjoy that game that you’re playing. While Knights of the Fallen Empire was our most successful expansion to date, we still spent a lot of time getting feedback on how we could make it better. At level 70, the new cap, you’ll have a whole new batch of things to worry about. In Galactic Command, you’re essentially in charge of the galaxy. It’s the climax of the power fantasy – you’re at the centre of everything. But you’ve got to hold onto that power by, you’ve guessed it, becoming even more powerful. Everything you do nets you XP that increases your Galactic Command rank, letting you play the game the way you want to. You can replay old chapters and make different choices – they won’t change your personal, canon story, but they will let you see how things could have played out. You can tackle Uprisings, a mode that pits you and a group against dissidents that have risen up to challenge your rule. And all the old content, five years’ worth of stuff, can be replayed and still contributes to your rank. Ultimately, this makes you stronger through loot crate rewards that you get for every rank. It’s a meaty expansion, then, with a bit of something for everyone, whether you want to group up and fight challenging bosses or you just want to finish the story of the Outlander. If you’re a premium player – a subscriber – you’ll already be able to check it out and hopefully defeat Vaylin once and for all.